Spring Break is determined to keep me on my toes. Here is my very easy meal plan for the week. Loaded Baked Potatoes and Broccoli Cheese Soup– it occurred to me the other day that I hardly ever make my family baked potatoes. Load them up and that is an easy dinner! Beans and Rice– I’ll make the beans in the crock and the rice in a rice cooker. How easy is that?! I likely have some leftover chicken in the freezer that we could heat up and add to the beans and rice as well. Baked Cheese Raviolis– just take frozen raviolis and place them in a 9×13 pan (straight from the freezer), top with your favorite jar of spaghetti sauce, some cheese and bake until bubbly. Served with salad and bread. Ham and Cheese Pasta– this is really good and it will makes lots for leftovers. Served with salad and fruit. Shamrock Pizza– the kids really like to make individual pizzas, so they’ll be excited to decorate their own! Fun! What are you serving at your house this week? Anything green for St. Patty’s Day? Do you need some meal planning inspiration? 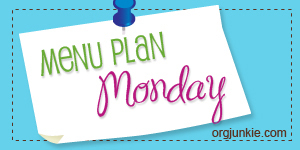 Check out Org Junkie where hundreds of bloggers link up and share their weekly meal plans every Monday. Hope you enjoy the ham and pasta bake! !